Grace wants to be able to do everything other children do and now that she has Roxie she can. If Grace needs help, Roxie knows exactly what to do. 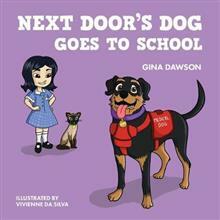 With insightful illustrations and written in a sensitive and friendly style, Next Door's Dog Goes to School is about understanding th... read full description below. Grace wants to be able to do everything other children do and now that she has Roxie she can. If Grace needs help, Roxie knows exactly what to do. With insightful illustrations and written in a sensitive and friendly style, Next Door's Dog Goes to School is about understanding the important role of dogs in our society and how they potentially change people's lives. Author Gina Dawson spent much of her teaching career presenting a range of programs on growth and social issues in schools. She is a lifelong lover of dogs, an experienced trainer and is cognizant of the disability sector. Next Door's Dog Has A Job was written as a result of observations as to how children may inadvertently cause difficulties or stress to dogand- person teams that they encounter. It aims to promote discussion and understanding about the important role Service Dogs play within society, the range of disabilities they assist with and the work they do.